The emergence and flowering of psychedelic art coincided with one of the most revolutionary and rebellious periods of the twentieth century, situated to the late 60’s and early 70’s. The so-called “Summer of Love” was an explosion of contemporary art and popular culture that is blended with the libertarian claims of pervasive social changes in attitudes of civil disobedience. It was a celebration with new psychedelic aesthetic sensitivity and reaching all forms of art: visual arts, music, film, architecture, graphic design, theater, fashion, etc. It also created their own forms of expression, hybridizing and synthesizing traditional forms in multi sensory events with celebratory spirit and ceremonial. The Summer of Love rebuilt the original creative impulse of utopian ambitions expanded it’s aesthetic into a broad cultural and political sphere, aligning themselves with the movements of “human rights” and “end of the Vietnam war.” The aesthetic movement of psychedelic influence in many aspects of popular culture, as well as several artists steeped in the counterculture movement, breaking the boundaries of disciplines, genres and media, with important contributions in the graphic design of posters, album covers, newspapers and magazines underground. Currently, thanks to careful and beautiful historical works, several works of this period were recovered, notably movies, videos, multimedia environments, recreating the immersive experience of psychedelic, their ceremonies and performances lights. The movement spread around the world, including strong influences and odd contribution of Brazil. But it is worth noting some “arche locus”, most references to the movement: “Haight and Ashbury” that is a sub-district of San Francisco, California; UFO nightclub London; Fillmore Auditorium in San Francisco; events “Human Be-In” in Golden Gate Park, preferred place of legends Allen Ginsberg and Timothy Leary. 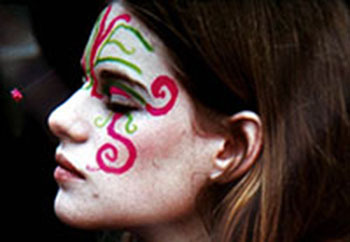 The beginning of the Summer of Love has been popularly attributed to the big event Human Be-In in Golden Gate Park in January 1967. The strength and size of this event sparked the mass media for the existence of the counterculture that was being cultivated in Haight and Ashbury. The counterculture movement was fueled by the media, especially The San Francisco Oracle, which in 1967 surpassed half of a million readers. Also noteworthy, as the driving force behind the movement, popular theater and street activism done by the Diggers, an important reference group for psychedelia and the Hippie Movement. The underground press, that emerged during the 60’s, was a means of alternative communication and democratization of ideas. Among the many publications around the world, it is worth mentioning: Oz magazine, International Times, East Village Other, San Francisco Oracle. These and other publications provided a rich portrait of a busy period with moral and political changes. They also witnessed an extraordinary outpouring of creativity that revolutionized the vocabulary of graphic design. Gradually, college and university students began flocking to Haight and Ashbury becoming thousands in the spring of 1967 and transforming the “arche locus” of psychedelia in a burst of spontaneous creativity with street art. Colors, many colors. The government of the area began to worry about these events and tried to block the way of students toward the “arche locus”. However, the summer holidays and several articles and reports in the mass media have become completely impossible government intentions. In the spring of 1967, community leaders Haight and Ashbury created the Council of the “Summer of Love”, giving the event a huge popularity through “by word of mouth”. 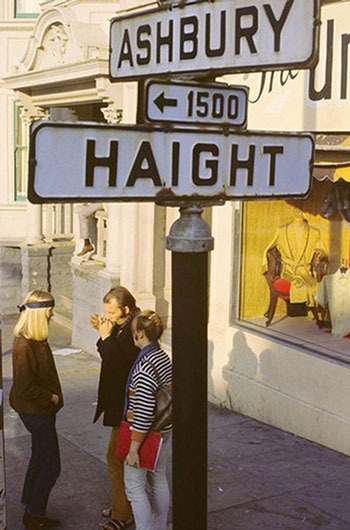 During the “Summer of Love”, about 1000.000 youth from around the world gathered in the district of Haight and Ashbury, but also in other cities of Berkeley and San Francisco. All gathered for a large version of the popular “hippie experience,” with free food and free love. There were also provided by the organizers, health clinics, to meet any abuse or even medical care for the needy. Stalls with cheap items were also offered to those who needed something extra. The Summer of Love attracted many public of various ages, from teenagers to mature adults, all fascinated by joining a cultural and political utopia. However, the huge influx of public has continued to cause problems. The district could not accommodate many public and the organizers failed to scale the movement to a dimension of mass. Quickly the scene of Haight and Ashbury, over time, deteriorated attributable to overcrowding, homelessness, hunger, and problems with drugs and crime. For all this, also deteriorated relations between the events and the residents of Haight and Ashbury, which, at the beginning, it took up a harmonious and peaceful way. Arriving autumn, many public left the “arche locus” for several reasons, especially to return to their student activities. But when they returned to their homes, communities and schools have brought along with them a remarkable experience with new ideas, behaviors, clothes, fashion and ways of life that have spread through the cities of the U.S. and the world. Naturally, as all aesthetic movement psychedelia does not come from nowhere. Past generations have explored the dimensions of psychedelia in ways and words, theorizing them too. However, remained restricted to small intellectual circles . From an aesthetic and poetic view, we may trace a line of pre-Raphaelite artists, through Art Nouveau and the “Beat Generation,” to the psychedelic art itself, which kept the profound influences of these predecessors cited. Notably, graphic design has clear and formal poetic similarities with Art Nouveau, especially in the use of floral patterns and attention to detail, following the influence and guidance of Gustav Klimt. The Beat Generation was the first major step toward a political and cultural change in American society or the dominant style “American way life”, which was exported to the rest of the world. Despite being predominantly a literary movement , called ” beatniks ” had a great influence on the New Left and the Hippie Movement. His literature was heavily influenced by political and Geo-political engendered after the Second World War problems. Jack Kerouac and Allen Ginsberg were two popular representatives and influential in Beat Generation movement, with strong repercussions on the Hippie movement and its psychedelic art. Attitudes and worldview (Weltanschauung) of the Beat Generation engendered the base of the Hippie movement, although the beatniks had a more pessimistic and less commitment to political changes in group movements vision. Remained something individualists, loners and rebels Community restrictions. Despite all influence and previous preparation, one cannot also deny a strong historical and formal specificity in psychedelic art and the Hippie Movement. The psychedelic art is distinguished by lush use of color, ornamental forms, the complex structure with obsessive attention to detail. Forms express the expanded states of consciousness or altered by music, light, meditation and hallucinogens. Recently we see an interest in the revival of this aesthetic style, expressing ways of living, inhabit and perceive the world . He has captured the imagination of artists, designers and filmmakers again. However attitudes towards this cultural movement ranging from a deep reflection and study up a superficial postmodern appropriation. The superficial perspective seeks to exalt the vintage look and appearance of what was a “golden age”, while some artists seek to develop a reflection of the movement as libertarian moment also suffered the plight of many “broken promises” by history. Finally, the relationship between this and that numinous moment in history is manifested by a historical reading “against the grain” , as proposed by Walter Benjamin. The fundamental requirement of Benjamin ‘s writing history against the grain, i.e., for the vanquished – against conformist tradition of historicism that commonly enters empathy with the victor (1971). Rejecting the modern Goddess worships Progress, Benjamin puts at the center of his philosophy of history the concept of disaster. According to him, the catastrophe is progress and progress would be a disaster. The disaster is the continuum of history and libertarian promises (cracks ) that were suffocated by this continuum (Habermas, 1981). Have other reinterpretations of aesthetics psychedelia just uncritically absorb his poetic procedures, thus emphasizing only the “vintage” of the climate movement. This is a farce, as the historical is not repeated, as Marx said. The psychedelic movement had no reference to himself as to repeat, this was instead an absolutely innovative gesture in history. In Brazil we highlight some events that did flourish and triggered the Flower Power and Hippie Movement. 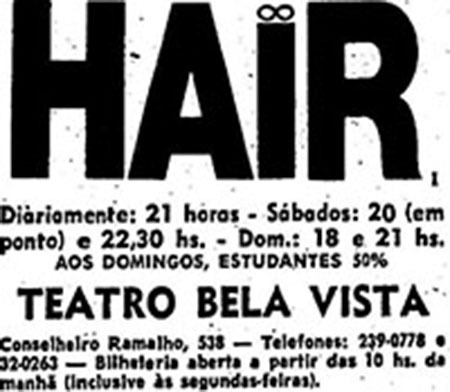 The staging of the musical Hair, all singing in Portuguese, in 1969/70. The film “Geração Bendita” (Blessed Generation) by Carlos Bini showed Quiabo’s, the Hippie community at Friburgo. The rock shows at Aquarius Theater in Sao Paulo and “Tenda do Calvário” (Calvary Tent), basement rented the Church of the same name, in Benedito Calixto Square, also in São Paulo. The performances of outdoor rock, in particular, held at Ibirapuera Park in the mid 70’s. I quote these by affinity, but here are many others that should be remembered. We should also point out that psychedelic art was much present in the Tropicalia movement, since the work of Hélio Oiticica, to music and graphic design from around the tropicalism. No more falsehoods or derisions? Golden living dreams of visions? Gene Anthony, Hippies on the Corner of Haight and Ashbury, 1967, Inkjet print (reprint) , 35.6 x 27.9 cm, Collection of Wolfgang’s Vault, San Francisco, © Wolfgang’s Vault. Albert Alotta, Peacemeal, 1967, Film still, Courtesy the artist and the film-makers cooperative. 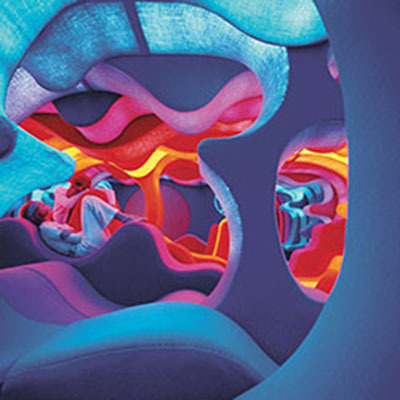 Verner Panton, Phantasy Landscape, 1970, © Panton Design, Basel. Divulgação da montagem de “Hair” no Brasil, 1970. Benjamin, W. (1971). “Thèses sur la Philosophie de l Histoire”. In: Poésie et révolution. Trad. Maurice de Gandillac. Paris: Lettres Nouvelles. Bini, Carlos & Kohler, Carl & Doady, Carlos. (1971). Geração Bendita. [Filme]. Direção de Carlos Bini, Produção de Carl Kohler e Carlos Doady. Produção Independente, Nova Friburgo, RJ. Burroughs, William. (1992). O almoço nu. São Paulo: Brasiliense. Carmo, Paulo Sérgio do. (2001) Culturas da rebeldia: A juventude em questão. São Paulo: SENAC/São Paulo. Ginsberg, Allen. (1984). Uivo, Kaddish e outros poemas. Porto Alegre: L & PM. Habermas, J. (1981). “L’actualité de W. Benjamin. La critique: Prise de Conscience ou Pr servation”. Revue d Esthétique n 1. Leary, Timothy. (1989) Flashbacks. São Paulo: Brasiliense. Maciel, Luís Carlos. (1997). Os anos 60. Porto Alegre: L & PM. Marcuse, Herbert. (1982). A ideologia da sociedade industrial: O homem unidimensional. Rio de Janeiro: Zahar. Newfield, Jack. (1969). Una minoria profetica: La nueva izquierda norteamericana. Barcelona: Ediciones Martinez Roca S/A. Pereira, Carlos Alberto Messeder. (1992). O que é contracultura. São Paulo: Brasiliense. Roszak, Theodore. (1972). A contracultura. Petrópolis: Vozes, 1972. Sculatti, Gene. (c9185). San Francisco nights: the psychedelic music trip, 1965-1968. New York : St Martin’s Press. Selvin, Joel. (c1994). Summer of love: the inside story of LSD, rock & roll, free love, and high times in the wild West. New York, N.Y., U.S.A. : Dutton. Tomlinson, Sally Anne. (1991). San Francisco rock posters, 1965 to 1971. Dissertation by Sally Anne Tomlinson. Location: California State Library, Main Lib NC1849.R6 T66 1991 California. The San Francisco Oracle. (1991). Facsimile edition : the psychedelic newspaper of the Haight-Ashbury, 1966-1968 / edited by Allen Cohen. 1st ed. Berkeley, CA : Regent Press. This entry was posted in Aesthetical, Art, Communication, Ethical and tagged Aesthetics, Contemporary art, Immersive Environments., psychedelia, psychedelic art by Eduardo Cardoso Braga. Bookmark the permalink. Refletem em Jesus Cristo Superstar! he he Bom dia amigo. Mais uma surpresa! Bom dia, amiga Maria Tereza Penna. Um grande abraço e saudações mineridade em pencas.